With over 40,000 attendees, InEvent supported Santander with accreditation, interaction, engagement and communication technologies on the largest corporate event in Latin America's history. Santander Annual Meeting took place on December 2, 2017 at the Allianz Parque stadium. InEvent and Santander teams worked together for more than three months to have excellence at its entire digital experience. It was an unforgettable year-end party for the employees of one of the largest financial conglomerates in the world. 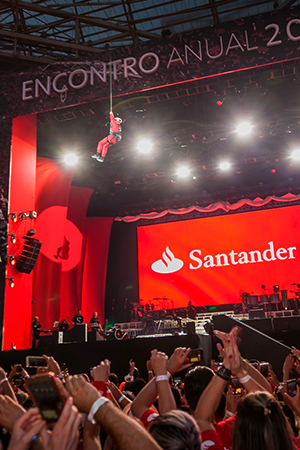 In addition to famous Brazilian pop singer Ivete Sangalo concert, another unexpected attraction surprised everyone: Sérgio Rial, Santander's President, rappelled down to the stage. 'Exceeded expectations, very well organized, and the care and attention with the attendees were excellent' - Andre Luis de Queiroz Rangel, who attended the event. In a closed and exclusive corporate event for thousands of Santander employees, it was essential to have agility, security and control throughout the operation. As an internal Santander event, it was necessary to monitor and track each one of the 40,000 attendees individually. Tracking employee times of entry into the event was essential. Layoffs and hires needed to be synchronized with the attendees database. Revoking access to former employees and adding new ones on the eve of the event, fast, simple and without harming the attendee's experience, was an important problem to solve. Tickets generated in the mobile app had to be unique and non-transferable: tickets couldn't be shared with other people with screenshots or borrowed mobile phones. To ensure each of the 40.000 attendees had their individual digital ticket available on their mobile phones, upon arrival at the stadium, it was necessary to create an effective communication strategy between the organization of the event and the attendees. A low adoption of the event's app would cause extensive queues, ranging from hundreds to thousand of hours. Engage with 40.000 attendees in real time. It was imperative to be prepared for unexpected (or unwanted) events. The QR code ticket had to be generated days before of the event, since there was a possibility of lacking carrier signal or wifi. It was also necessary to certify the entry of people without phones due to events such as theft, loss or simply for those who weren't in possession of their phones. InEvent Pass brought speed and security during all the accreditation process: each attendee received a personal and non-transferable QR Code generated by the app. InEvent integrated the QR Codes readers with stadium turnstiles for an automated and controlled entry, a process that took less than three seconds per person. InEvent performed several tests prior to the event at Allianz. Adjustments on the phone app were made, such as forcing the screen brightness to its max to facilitate the turnstile scanning. Tutorials and notifications were sent so attendees would open their QR Codes when arriving at their respective gates. For a fast entrance and to provide full support onsite to the participants without mobile phones due to incidents, it was essential that 98.7% of the attendees were digitally enabled to access the stadium. This meant more than 35,000 downloads of the official event app with secure login and an unique QR code prior to the event had to be deployed for each of the thousands of attendees. The QR Code was saved in the app cache, allowing the entry of attendees even without any carrier signal or wifi. To encourage attendees to download the app and sign up, InEvent used the Interactive Ranking System. It was possible to identify which employees were most digitally engaged. Campaigns were created requesting to the most digitally engaged attendees to help their coworkers to download the app too. These campaigns with pushes and notifications in mobile phones, plus other communication initiatives made by InEvent, guaranteed a 99% rate of app download before the event. 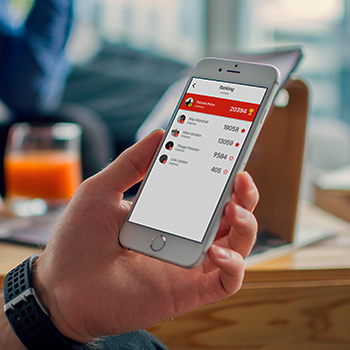 InEvent developed the Santander Events app, which enabled attendees entrance to the stadium plus a personalized real time communication and interaction channel with all attendees. The event organization could send targeted notifications, share information in a exclusive news feed and create custom tabs with specific information about the event. A poll module within the app was also used to choose the event's mascot name. A social media media campaign was created using the hashtag #thisismybank. All posts on Instagram and Facebook with this hashtag would be replicated in the app feed. Attendees could also get support and communicate with the event organization through the app. Lastly, the organization used the app news feed to promote videos, share the event countdown and post all pre-event communication. InEvent supported the Santander's event organization in delivering the best experience to attendees. 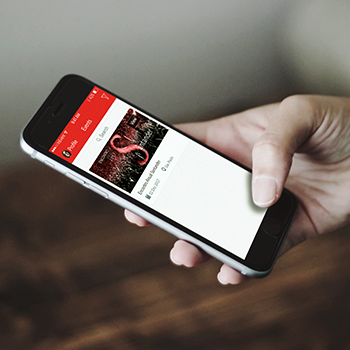 OnSite Support ensured Santander Events App content management, notifications pushes and updates. Before, during and after event InEvent kept track of all the event app activities and provided attendee support. 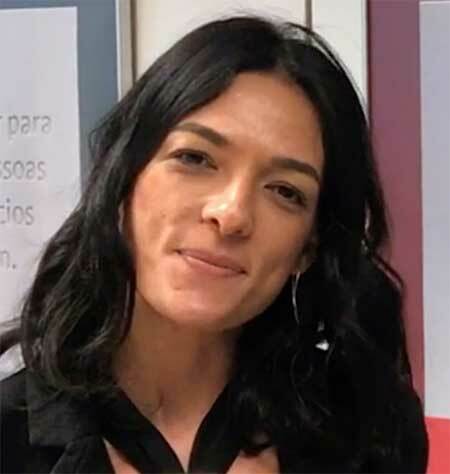 With this service, Santander not only counted with InEvent operational support but also received a complete report with user data, timed statistics and final results.